Here’s a video that shows how I make twelve-loop double braids. (I’m braiding the hollow variation of the braid in this video.) This is the next step up in numbers of loops from the traditional 10-loop double braid. If you’ve already learned my solo-braider method for making 10-loop double braids, and my method for braiding 11-loop square braids, this demo should be enough to show you how to combine those techniques in braiding a 12-loop double braid. If you are new to my site, please don’t be put off from loop braiding because this video makes it look too complicated! – I have many tutorials for fun and easy loop braids, see my Tutorials index. 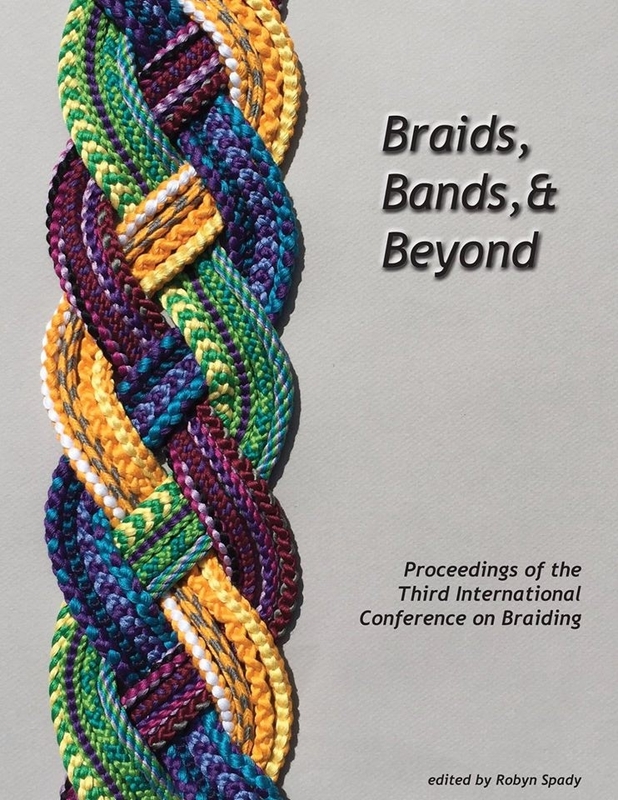 In the first part of the video I show some braids in my twelve-loop double braid sample book. I’m calling this post a demo rather than a tutorial, since it’s pretty minimal — just includes the one video below, and not much in the way of text or photos. This video only demos the hollow braid variation, but flat, solid rectangle, divided, and all the other double braid shapes can be made with this same 12 loop procedure. In braids that have a greater number of transfers than the four loop transfers of a double braid (letterbraids, the Catherine Wheel braid, my various plain weave loop braids, etc), I use very similar methods of holding and shifting the loops, including any extra loops on the thumbs. 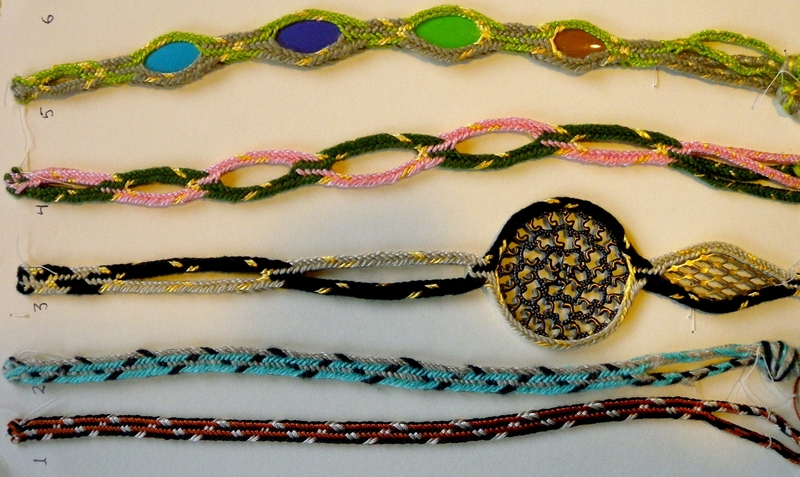 The 3 braids on the cover-photo of the video above are 12-loop hollow double braids. (If you don’t see 3 braids above, try refreshing your browser page.) The middle braid has the color-pattern I am braiding in the video. Braids in photo: black embroidery floss, white 5/2 perle cotton, gold viscose rayon. In the video, I used heavier yarn. 1:02 Examples in my sample book of various 12-loop double braids. 6:36 How to check to make sure your color-pattern is still in the correct order. 10:28 Brands of yarn I’m using in video. 13:54 Parking the loops of the half-done braid on a wide-toothed comb. For more hollow braid color-patterns, check out my tutorial for 6-10 loop hollow double braids. It includes the set-ups for several different color-patterns, including some with openwork, which can all be expanded to 12 loops. By mistake, near the end of the video I suggest learning the 13-loop square braid first. I meant to say 11-loop square braid (link above). That’s the one that calls for holding two loops on the little finger, like this 12-loop double braid. By the way, I’ve realized recently that many youtube viewers of my videos are not aware of my blog, that’s why all the references within the video on how to get here! *So far I haven’t heard from anyone adopting/ using my 11-loop braid method, and the youtube statitistics page shows that those videos get very few views. Kind of discouraging, because it’s basic info for any of my braids of more than 9 loops. If anyone out there gets into 11-loop braids, I’ll have an incentive for making more “too-many-loops” videos! Great video. Look forward to seeing you at CNCH in Oakland in April. Thanks, Connie, I’m looking forward to it too!